Birthday present for a friend of mine. Yessss, this is amazing! Top notch awesome sauce yo! Sonic and knuckles rivalry is best. Knuckles is definitely rougher than the rest of them the best of them unlike Sonic. Loving the atmosphere this picture pulls you in. Its like we have a photo of the moment before the epic battle. "So you were planning to steal the Master Emerald after all! I'll have your guts Sonic!" "What'd Eggman tell you this time? Whatever! Let's do this!" "Do you guys always have to fight like this? It never ends any different..."
Classic dialogue ,especially from the earlier classic issues of Sonic. Whether they returned to this, with the Ken Penders mess at #252, I do not know. 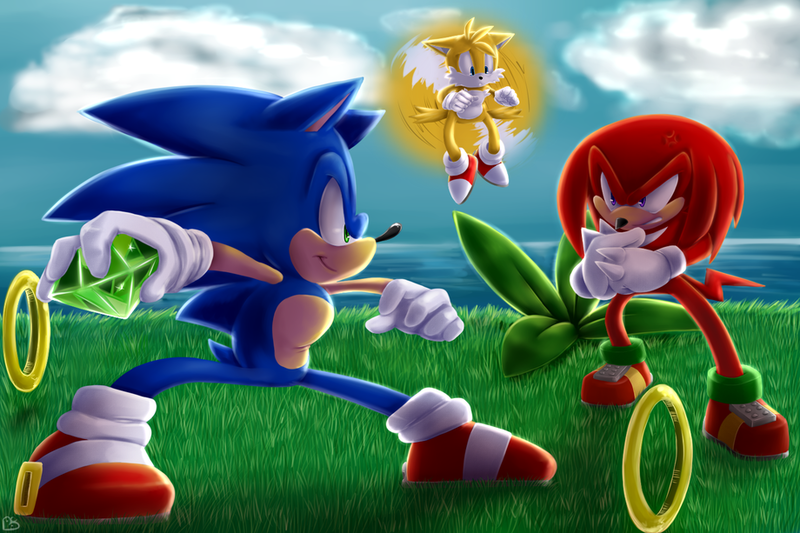 Knuckles: "No time for games Sonic. Give me the master emerald you have right now!"